Solar Biotronic Laboratories Private Limited (SBL) has been developing and suppying Sealed Keyboard Switches using various Switch Technologies for more than 25 years now. Over this period of time, SBL has developed unique Switches using Illumination, Piezo Sensing and Capacitance. 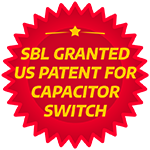 Taking the Capacitive technology further, SBL has now developed the CAP-MECHTM series of switches. The SBL CAP-MECHTM Switch combines the Capacitive sensing with the Mechanical action in a switch. This means that the switch is sensed using the capacitive technology (giving it infinite life!) and also offers a tactile feedback. The United States Patent & Trademark Office has recently granted a Patent for this development ( US Patent #. 9,847,782 ). The SBL CAP-MECHTM switch technology throws up a wide range of applications that it can be used in. These Switches can be offered as Intelligent Progressive Push Buttons, Intelligent Rotary Encoders with interactive communication, etc. There are limitless applications for the SBL CAP-MECH Switches in some of the areas as given below.